Mobile patrol app systems can simplify security operations management greatly, but not if the software confuses your officers and administrators to the point where the mobile patrol app is never deployed. 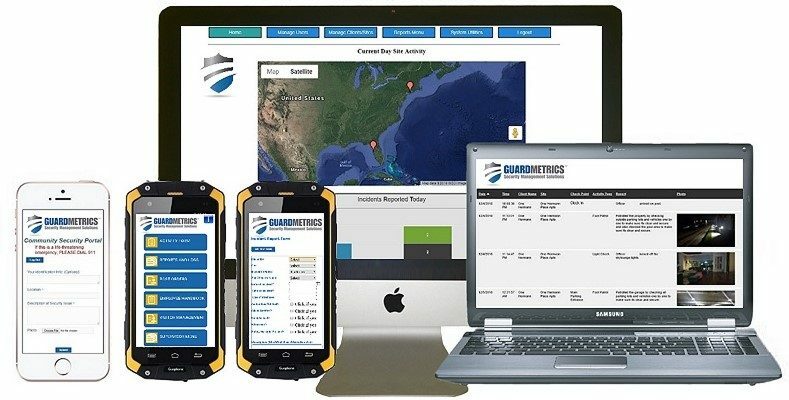 The experts at GuardMetrics have felt your pain (literally), because our primary developer comes from the security guard industry and learned software engineering in order to create the easiest way possible for your people to get you—and so, your customers—everything you expect from a mobile patrol application. Scanning checkpoints is a one-click process with the GuardMetrics mobile patrol tracking and reporting system and allows the officer to dictate a note at the scanned checkpoint and attach a picture through the mobile patrol app, if relevant. It would seem to go without saying but, because many mobile patrol apps only allow a picture to be taken once the report is open, we also allow an existing picture or video to be attached to a newly open scan or report. Particularly with something like an Incident Report, this is actually a safety issue; your officer should not be fumbling with opening an incident report if involved in a potentially violent situation. He can take a pic and/ or video with his device and attach it to a report once the incident is under control. Call us or click here for a demonstration of the simplicity and safety of this mobile patrol app! 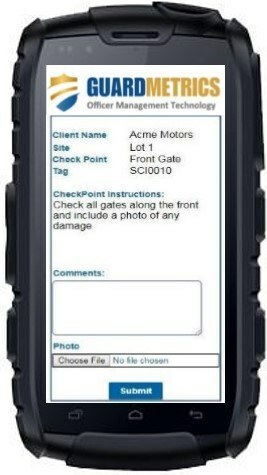 An instruction can even pop up for your officer when they scan a checkpoint, which is easily added, changed or deleted through your Management Portal. These instructions can be a permanent order, like; “Patrol back lot twice”, when at officer scans a REAR PARKING LOT checkpoint tag, or something more specific and temporary, like; “ALERT: Two vehicles were broken into in this lot Monday Night”. One of the great features of the mobile patrol app is your ability to receive an “exception alert” when a specified checkpoint(s) has not been scanned as scheduled. You can easily set-up these mobile patrol app alerts through your management portal and attach them to any number of checkpoints. One of the more common uses is the CLOCK-IN. Once set, you or anyone you assign will receive an alert If an officer doesn’t clock-in to a site on time. And every scanned checkpoint and guard tour and patrol activity or report is geotagged with a GPS photo, to show you exactly where it occurred, in real-time. Call GuardMetrics for a simple mobile patrol app that alerts you when checkpoints are not scanned on time. The mobile patrol app works on any mobile smart-device; including but not limited to iPhone, Android and Windows phone. This officer patrol monitoring system has even been developed in such a fashion that your officers can use their personal phones and it will not cost them in data usage nor battery life! This is some of the only guard patrol management software available that can make that claim. This mobile patrol app includes Daily Activity Reports, Incident Reports, is a part of the GuardMetrics officer management system. This guard business software also includes guard tour software, a Management Portal from where you can control the system and run reports, a Client Portal for clients who you wish to receive approved real-time reports, visitor management and facility access control, and many other advantages, including the Community Security Portal, which offers a layer of security that your potential customers cannot get from 95% of your competitors. Call us today for a mobile patrol app that is just one great piece of the GuardMetrics officer management system!